We have been uncharacteristically quiet of late — it goes with the Marshwiggle physiognomy and the unwieldy amounts of pollen in the air. But there are a few things that want mentioning. ¶ Much thought is going into tato boxes, whereof the dining room is slowly being buried. A crease pattern for the above. It’s like learning a dance or a fencing move, but with a lot of trial-and-error, as we discover which steps matter and which are ornamental. And then we forget again. Someday, it’ll be a handy algorithm, but not today. (The curves, here, are particularly difficult to describe. When I make them, I know the curve wants to go thisaway and then thataway — the word is probably tractrix, but this is just a sound to me.) Mélisande* and I will be teaching a Monday session on tato boxes at the Convention this year, by the bye. ¶ Eric Gjerde‘s book is slowly fighting its way out of the world of forms and into a bookstore near you. Keep your eyes peeled. ¶ I am profoundly dissatisfied with the constitutional structure of OUSA. There, I said it. You don’t have to do anything about it — I’m certainly not going to. I like and respect the people in the administration, but it has been and continues to be a regional group that pretends to represent a nation of folders. It doesn’t. Bless them, they’re trying, but you can’t put web 2.0 lipstick on a 19th century pig. We need a whole new model hog. ¶ Brazilian mathematician and origami artist, Jorge C. Lucero has launched a blog, chock full of interesting things. Of course, I spent ten minutes trying to google the Greek mathematician, Antigüidade. I had never heard of him and he posed some fascinating problems. Hmm. No, I won’t tell you who he is. ¶ If you like folding dollars, you might try this. It’s a variation of the Dollars to Doughnuts fold and divides the dollar into a 9 x 21-point-something grid. Named the Hoppin’ Bobbin, a bobbin being a small steel gizmo that sits under the plate of a sewing machine and holds thread. You lap the left end over the right to the gray vertical — it represents the 16th division — and then collapse like a mad thing. There is no trick to this, just brute force and psycho-accuracy. You’re left with a one-sheet hyperboloidal spring that you can play tiddlywinks with. Or quarters, maybe. Hey, you’ve got to do something with your dollars — you sure as hell can’t buy oil with them. Have a crease pattern. 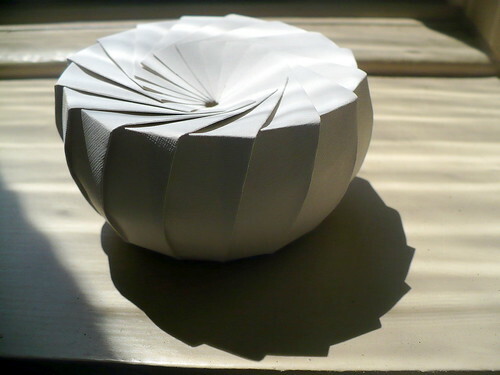 This entry was posted on Sunday, June 8th, 2008 at 10:34 am	and is filed under box, circle, content, crease pattern, creative commons, curved surface, dollar, open source origami, tato, twist. You can follow any responses to this entry through the RSS 2.0 feed. You can leave a response, or trackback from your own site. I am still laughing for your difficulties in finding about the great mathematician Antigüidade. I wish there was a good way to have posts in several languages, other than writing them myself. The machine language translators I tried were just awful. Thank you for mentioning my blog. It is amazing how fast the blogshpere works…I just launched the blog two days ago. Having read up on Antigüidade, I can now say, we’ll not see the like of him again. A greater mathematician never lived. I will recommend to you technorati.com, which will tell you if anyone is linking to your blog. And wish you the best of luck on your launch. You do BEAUTIFUL stuff. I particularly enjoyed the lettered boxes.